Rare c.1880-1890 Numerous reproductions exist. 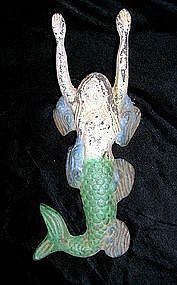 This is one of the few real 1900 century mermaids that this gallery has seen. Excellent condition. Some rust as expected. Some paint loss. 9.5" length. 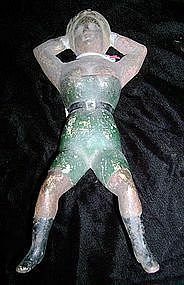 Cast Iron Polychrome Figure. Green and black pigments. Some rust, paint loss. Otherwise good condition for age. c.1880-1890. 10 1/2"